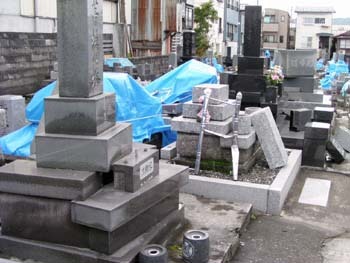 Tombstones toppled by the earthquake. Tombstones have long been used as an idicator of the strength of earthquakes. They are still used to gauge the strength of earthquakes that occurred before seismic records were available. The regularity of their shape makes them a good indicator. Photo by Kazuyuki Takemoto (3 more below). It might seem obvious to the average man or woman in the street, or the average child in the playground for that matter, that you don't build nuclear reactors in an earthquake zone. But the average man or woman in the street, not to speak of the average child in the playground, would be naive to make such an assumption. Here in shaky Japan we've got 52 of them (soon to be 53) and not a single one has come crashing down - not yet at least. Just take the recent spate of tremblers in Niigata Prefecture. Buildings came down and the lights went out in Kashiwazaki City, but the nuclear power plant (NPP) stood out like a lighthouse in a sea of darkness, a beacon of hope proving that man is master of the elements, technology conquering nature once again1. If, for a moment, the inhabitants of Kashiwazaki felt that nature had got the better of them, all they had to do was glance over at that island of light. Not that any of that light shone in Kashiwazaki itself. That precious commodity was all sent off to the capital2, but still, they could enjoy it vicariously. I suppose we should acknowledge the reports that a few hundred liters of coolant overflowed from spent fuel storage pools, but we can be sure that not a drop would have been released into the environment. Nevertheless, it must have been difficult in the early days to convince a skeptical public. No matter how good your propaganda department is, the public isn't totally stupid. To deal with this problem, the visionaries in the government and in industry thought up a very clever scheme to help people understand that the nuclear reactors they proposed to build would not fall over. This scheme had three basic aspects. The first was to claim that scientists knew where earthquakes would and would not occur. The second was to claim that these same scientists could predict how powerful the strongest earthquake would be in a given place. The third aspect of this scheme was to play on people's belief (common at the time, though few subscribe to it these days) in technology. Ever since Homo sapiens strode out of Africa about 150,000 years ago, with just a club and a few stone tools in his hands, it's been all progress. Our manifest destiny was to conquer nature and technology was the means by which we would fulfill that destiny. Such was the popular belief at the time, so when these visionaries told people that the nuclear power plants that they were going to build could withstand the most powerful earthquake possible, people swallowed it. But apart from the shining example in Niigata the other day, how has the record been? Well, it has to be admitted that the scientists got it wrong pretty often, but heck, they were trying to sell a great idea. You can't blame them for a bit of exaggeration. Anyway, let me give you a few details. When designing earthquake-resistant features for nuclear power plants, buildings and equipment are categorized in four levels of importance, on the basis of the potential damage from a release of radiation into the environment. Until July 1981 there were only three classes: Class 'A' being the most important; Class 'B' being for buildings and equipment with less safety significance than Class 'A'; and Class 'C' being for buildings and equipment which have the same safety significance as general industrial facilities. Class 'A' buildings and equipment must be able to withstand the strongest predicted earthquake, known as the 'design-basis strongest earthquake'. The magnitude of this earthquake is assessed on the basis of past earthquakes and the likely effect of active faults. A higher classification, Class 'As', was introduced in July 1981. This includes buildings and equipment in Class 'A' which are deemed to be especially important. These buildings and equipment must be able to withstand what is called the 'design-basis upper limit earthquake'. People could be forgiven for wondering what the difference is between the 'strongest earthquake' and the 'upper limit earthquake'. It's probably easiest to put aside your linguistic intuitions and just believe me that the 'upper limit earthquake' is envisaged as being even bigger than the 'strongest earthquake'. That would have to make it a real whopper one might think, but not necessarily. In cases where no active fault has been discovered in the vicinity, it is considered to be a magnitude 6.5 earthquake directly beneath the NPP. Astute readers might have noticed that reactors built before July 1981 weren't designed to cope with the 'upper limit earthquake'. Fortunately, the new rules specifically state that they don't have to go back and redesign the old reactors. Actually, in several cases the original calculations for both 'strongest earthquake' and 'upper limit earthquake' were found to be too low and subsequent reactors were built to more stringent design standards. But none of them is designed to withstand an earthquake of the scale of the one which hit Kobe in 1995. The most severe earthquake considered is for Hamaoka-3,4&5, built right on top of a major plate boundary3. These are designed to withstand an earthquake of 600 gals4 at bedrock level. The Kobe earthquake was 833 gals. Just for the record, the measuring device on the Kashiwazaki-Kariwa-5 reactor recorded 54 gals at bedrock. Measurements were recorded in the order of 1,700 gals on the surface near the epicenter, but the Kashiwazaki-Kariwa NPP is about 30 kilometers away from there. Also the shaking is generally less at bedrock level. Power companies make much of this, pointing out that the foundations of their power plants rest on the bedrock. Almost all of Japan's NPPs are in, or very close to areas which are officially designated as requiring specific monitoring for earthquakes (a high chance of an earthquake of magnitude 7 or greater.). Also one shouldn't forget nuclear facilities other than NPPs: for example, the complex at Rokkasho, including, or soon to include uranium enrichment, spent fuel storage, reprocessing, MOX fuel fabrication and maybe even the ITER nuclear fusion facility. But Rokkasho was very conveniently left off the list of areas requiring special earthquake monitoring. It was on the original draft list, but at the time it was thought to be too remote and irrelevant, even though the risk of an earthquake was no less than other areas. Well it has become more relevant since they fingered it to become the center of the nuclear fuel cycle. I have mentioned the four classes of building and equipment. Some people might be interested to know what types of things are actually included in these classes5. As one would expect, the reactor containment vessel and the spent fuel pit are in Class 'As'. But there are some surprises too. For example, the turbine and the turbine building of Pressurized Water Reactors, made famous in the recent Mihama-3 accident, are in Class 'C'. The Nuclear Safety and Industrial Agency has admitted that the secondary system (i.e. the turbine side) really should be taken seriously in future, so it will be interesting to see whether the impending revision of the current earthquake guidelines reflects this new awareness. I've heard nothing to suggest that it will though. Actually, I suspect they would very much like to keep Mihama-3 strictly separate from the issue of earthquakes. If they drag that in they might be forced to address the problem of aging reactors. In as much as Japan's reactors were designed to be resistant to earthquakes (dubious enough in itself), those designs only applied to new reactors. They provide very little insight into the ability of old, poorly maintained reactors, with pipes below the regulation thickness, to withstand an earthquake. So returning to the question of how's the record, the visionaries might have understated the magnitude of the design basis earthquakes, they might have been a bit wayward in their classifications, they might have been a bit too optimistic about the durability of the reactors and they might even have missed a few active faults and earthquake zones here and there, but lets face it, no reactors have fallen over, no radiation has been released into the environment as a result of an earthquake, so what's all the fuss about? And in their defense, I return to my earlier point, namely that they were just trying to sell a great idea. No salesman is going to tell you that he's selling you a dud and no visionary technologist is going to tell you that we would have been better off without the industrial revolution. Give the guys a break. Break their bloody necks, I say. So finally, what of the people in Kashiwazaki City and Kariwa Village? They have been through a terrible ordeal, albeit less terrible than for people in towns nearer to the epicenter. If the epicenter had been right under the NPP, there might well have been a nuclear catastrophe. In that case, the emergency systems would have failed totally. People were sleeping out of doors, in their cars, in tents and so on to get away from collapsed and collapsing buildings. The last thing they needed was to be forced indoors to escape a release of radiation. The train services and the roads were in chaos. How would they have escaped if a major evacuation from the area had been necessary? There are emergency procedures in place in regions which host nuclear facilities, inadequate though they may be, but the logic of a nuclear evacuation stands in total contradiction with the logic of an earthquake evacuation. Realizing this, some people appealed to Tokyo Electric Power Company (TEPCO) to shut down the reactors until things returned to normal. But TEPCO management, due to its unshakeable belief in its own technology, or else through sheer bloody-mindedness, kept them going. However, of this, not a peep from the media6, so I doubt if many people in Tokyo were even aware that the power that supplied their TV sets, came from the region where the disaster was unfolding before their very eyes. 1. On November 4th, after this report was written, another tremor hit the region and Kashiwazaki-Kariwa reactor no. 7 scrammed. Tokyo Electric Power Company (TEPCO) says that the cause of the scram was a problem in the turbine. The other reactors continued to operate. The earthquake registered a magnitude of 5.2 and on the Japanese seven point seismic scale it registered 5 in Kariwa Village and 4 in Kashiwazaki. 2. The Kashiwazaki-Kariwa nuclear power plant belongs to Tokyo Electric Power Company, even though Niigata Prefecture is supplied by Tohoku Electric Power Company. 3. The Hamaoka NPP is right over the boundary of the Philippine and North American Plates. In fact, it is sandwiched between three plates - the two just mentioned, plus the Eurasian Plate, with the Pacific Plate not far away. Hamaoka-5 is due to commence commercial operations in January 2005. 4. Gal is a measure of acceleration. 1 gal = 0.01 m/s2. 5. See table below for more details. 6. The media did, however, report on the reactor 7 scram, almost two weeks after the original earthquake.